President Donald Trump condemned political violence on Wednesday after a number of pipe bombs were sent to his political opponents and critics. Secret Service intercepted the devices in the mail at the homes of Bill and Hillary Clinton and former President Barack Obama. Another device was sent to the mail room of CNN’s office in New York City, addressed to former CIA Director John Brennan, who has appeared on the network before. Devices were also discovered addressed to the offices of Democratic Reps. Debbie Wasserman Schultz and Maxine Waters. President Donald Trump on Wednesday weighed in on the series of explosive devices sent to a slew of top Democrats and Trump critics, urging Americans to unite against political violence. The Secret Service said Wednesday it intercepted explosive devices addressed to the residences of Bill and Hillary Clinton, as well as former President Barack Obama. 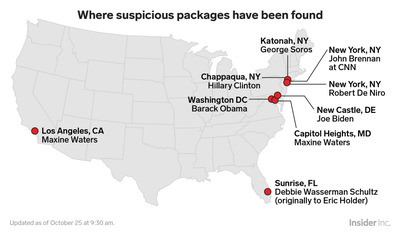 A pipe bomb was also sent to CNN’s mail room, addressed to former CIA Director and prominent Trump critic John Brennan, and others were addressed to the offices of high-ranking Democrats, including Rep. Debbie Wasserman Schultz, the former Democratic National Committee chair, and California Rep. Maxine Waters. 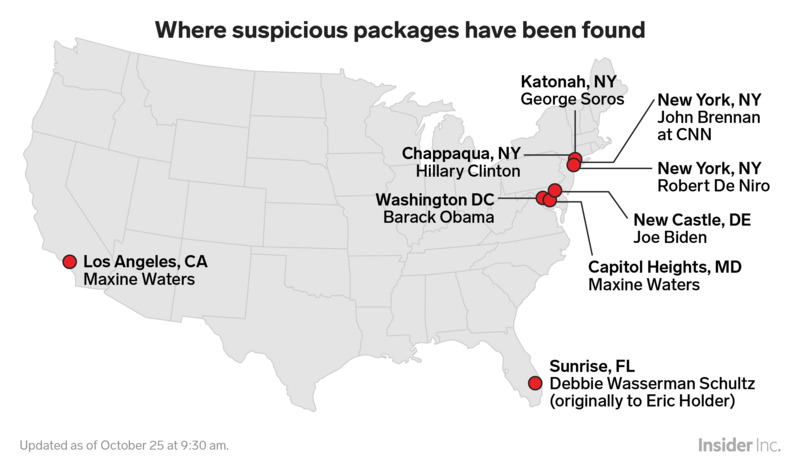 On Monday, an explosive device was also found at the home of the billionaire Democratic donor George Soros in Bedford, New York. No injuries have been reported from any of the incidents. Trump said he had been briefed on the devices by the FBI, Justice Department, Homeland Security Department, and the Secret Service.